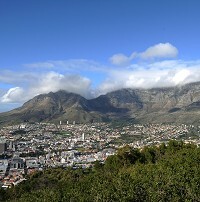 The number of tourists visiting South Africa showed a record increase of 15.1% last year, a figure which may prompt holidaymakers heading there to check for the best travel insurance deals. More than eight million tourist arrivals were counted, compared with just over seven million in 2009, said minister of tourism Marthinus van Schalkwyk. The minister said he was delighted with the figures, particularly in view of the global economic recession, which compared "very well in international terms". Global tourism arrivals growth was estimated from UN World Tourism Organisation figures to be 6.7% in 2010, meaning South Africa outperformed the global market by more than 8%, said Mr van Schalkwyk. It was important to acknowledge that the growth could be attributed to the 2010 FIFA World Cup, but was not driven just by the Cup's success, he added. The year's tourist arrivals were shown by the figures to exceed those of 2009 over all 12 months. "From the results of our survey on arrivals during the World Cup, we know that more than 309,000 tourists arrived in South Africa for the primary purpose of the World Cup," he said.